The American Revolution was a hard-fought war between scrappy volunteer soldiers and the professional army of an imperial power. Which side would you have picked as the likely winner? In this Theme we view the Americans' victory as a process, not answering how they won the war but exploring what they confronted, endured, and overcame to win the war. The nine sections focus on anticipating the war (and trying to avoid it), committing to one side or the other, leading the troops, sustaining the war effort, reporting its progress, fighting as soldiers and sailors, living as civilians during wartime, losing the war (the British, of course), and winning the war (those scrappy volunteer soldiers led by the resolute George Washington). 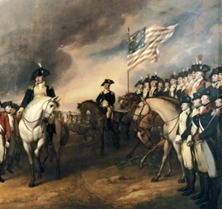 Image: John Trumbull, Surrender of Lord Cornwallis, oil on canvas, 1820 (detail). Courtesy of the U.S. Capitol, Office of the Architect of the Capitol.